On the volcanically active Indonesian island of Java, an astounding architectural wonder of Paleolithic civilization is being revealed by comprehensive archeological excavations at a sacred temple mount in Cianjur, West Java, Indonesia known as Gunung Padang, or 'Mountain Meadow'. Recent research at this sacred mountain site has revealed the volcanic core was refaçaded to create an immense step pyramid. The Padang Pyramid displays precise latitudinal alignment along 7° South, reflecting the same pattern observed at other ancient pyramid and temple complexes around the world. Giza sits at 30°N, Ba'albek at 34°N, Visoko at 44°N, Stonehenge at 51°N, Cahokia at 39°N, Chaco Canyon at 36°N, Alta Vista at 21°N, Tula at 20°N, Sukhothai at 17°N, equatorial Cochasqui at 0°, La Maná at 1°S, Chan Chan at 8°S, Mumbahuru at 20°S and Waitapu at 36°S. 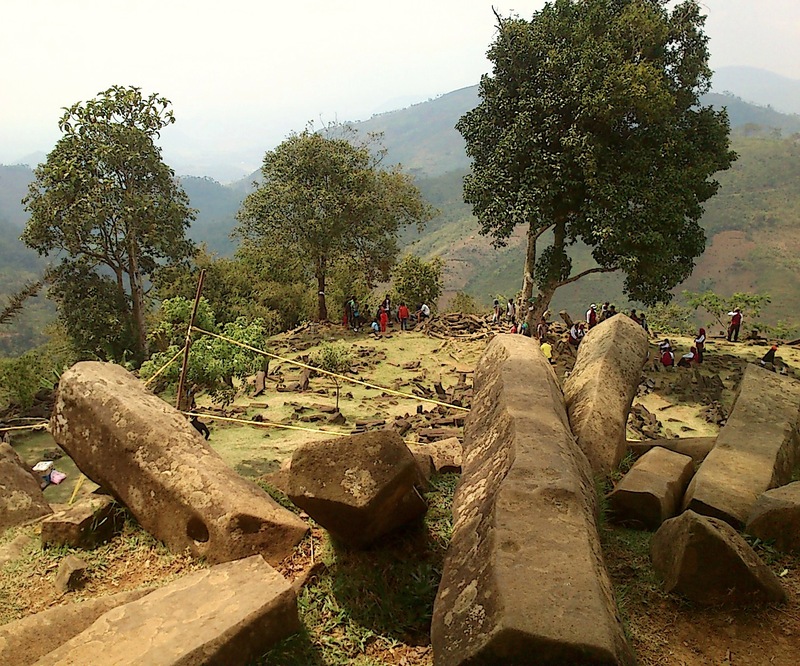 Likewise, ancient sacred sites with anthropomorphic megaliths in Indonesia's Bada Valley are geopositioned along the 1°N latitude for efficient infrasound reception. The Padang Pyramid in West Java, Indonesia (6.9934°S 107.0563°E) is situated 5,630 miles from the Great Pyramid, corresponding to 22.61% of the Earth's mean circumference of 24,892 miles, along a wide band of infrasound resonance equidistant from the 20% and 25% distance bands. This resonant 5,630-mile distance also approximates the 9/40 great circle fraction shared by sites in the United States where unusual spates of spontaneous piezoelectric fires have recurred with increasing frequency --in New York City in 2008, 2010 and 2014, in Long Island in 2010 and Brentwood, New Jersey in 2012. The Padang Pyramid is locally renowned in the Cianjur region of West Java for similar infrasound-induced EM effects, including bright flashes of light and related HHO plasma orb phenomena. 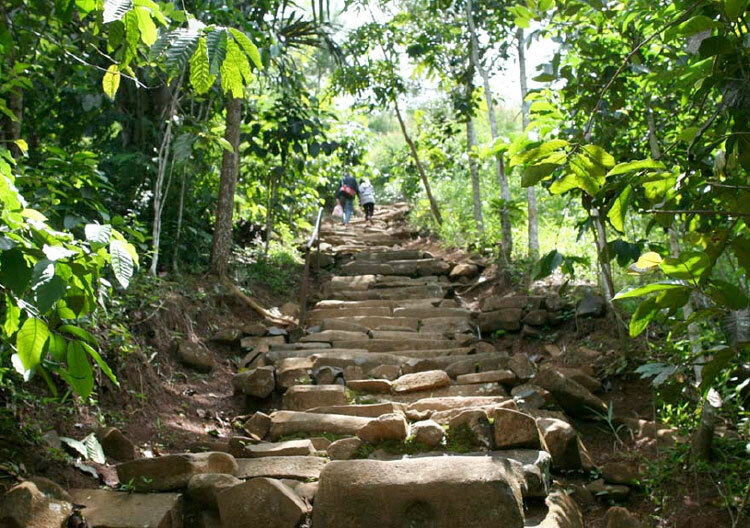 A long series of andesite steps ascend to expansive square platforms covering 3,094m2, composed of five large ascending terraces divided into large rectangular enclosures by a series of high walls. Used as a meditative retreat by successive rulers for uncounted centuries, and visited more recently by the local community, this refaçaded volcanic mountaintop temple site is associated with the nighttime appearance of bright flashes of light, as well as small, intensely luminous spheres seen floating above the platform. Terrace 1 presents the remains of several large rectangular walled enclosures that now lay in total ruin, having entirely collapsed on each of the five terraces during catastrophic earthquakes that followed the clustered cometary impact events of 12,890bp. The original walled enclosures of the Padang Pyramid once displayed a tight geometric configuration best appreciated from an aerial perspective (below). Aerial imagery of the Padang Pyramid provides an ideal perspective for appreciating the tight geometric wall configurations that are not easily discernable when standing on the terrace. The complex surface forms of the many megalithic plinths strewn about the five terraces display special interlocking features that were not carved, and do not bear chisel marks, but were artificially cast in huge kaolin clay molds. 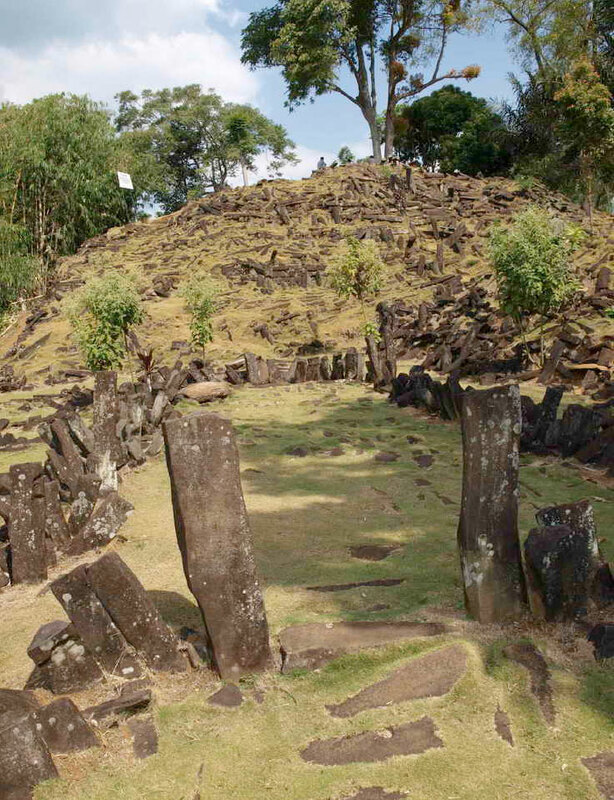 Thousands of exposed megalithic plinths atop the Padang Pyramid comprise the scattered remains of giant walled enclosures constructed in a highly distinctive header and stretcher format exemplified by the largely intact platform enclosure temples of Nan Madol preserved on the distant Micronesian island of Pohnpei. 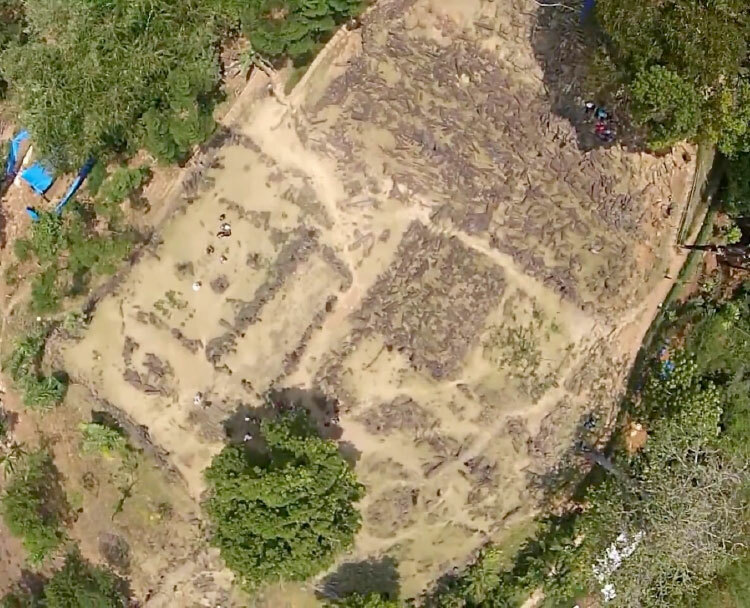 Square buildings at both sites signify the Paleo-Sanskrit glyph for Indra, the planet Jupiter. Extensive research conducted at the Padang Pyramid includes dozens of archeological excavations and geophysical surveys applying core drilling, ground penetrating radar, electrical resistivity and seismic tomography to discern internal structural features of the large pyramid. 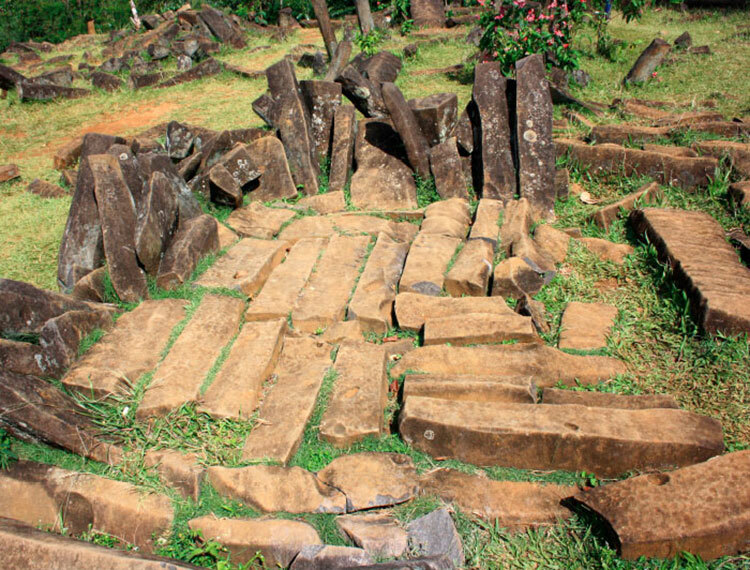 Situated atop an extinct volcano, Padang Pyramid was built using lava as the primary building material that was finely pulverized, mixed with clay, fly ash and water, and cast into giant walled platforms that acted as acoustic resonators. Showing a remarkable consistency with the contemporary Paleolithic pyramid complexes of Visoko, Bosnia and La Maná, Ecuador, the Padang Pyramid has been revealed as an artificial refaçading of a natural volcanic peak. Geopolymer casting techniques for the production of artificial sandstones, andesites or basalts have been uncovered at each of these restructured mountain pyramid sites. Structural analyses of the Padang Pyramid have defined multiple construction phases involving different formulations of magnetic geopolymer andesite columns cast in horizontal stacks, layer upon layer, reaching 26m in height. Huge 3m-long magnetic plinths were cast atop volcanic tuff bedrock in horizontal rows for withstanding tectonic shockwaves, bound together with an orange geopolymer cement mortar. 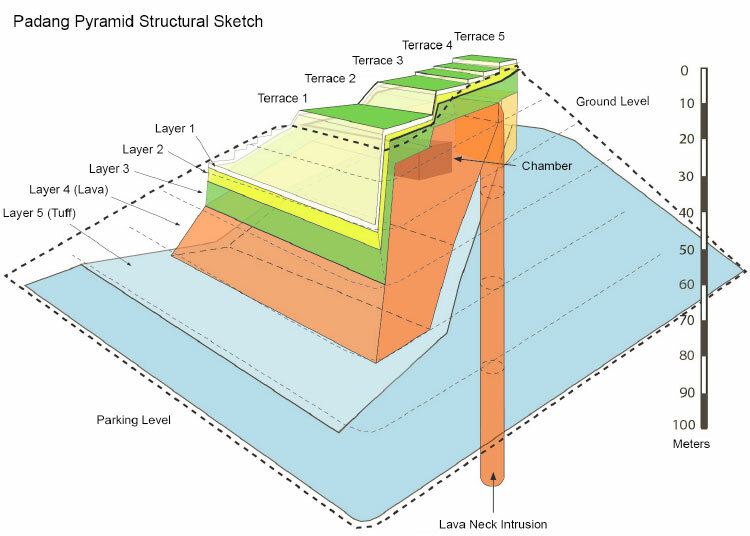 The concealed presence of a large main chamber below Terrace 2 was identified by seismic tomography scans that effectively differentiate the layered composition of a natural lava tube, synthetic andesites and volcanic tuff formations (diagram above). The large central cavity has not been directly confirmed by geological core drilling or excavation teams, who have only begun the task of accessing the chamber by excavation of a tunnel penetrating from the western slope. Architectural features and ancient remains within the chamber promise to resolve the many enigmas surrounding this giant Paleolithic monument. 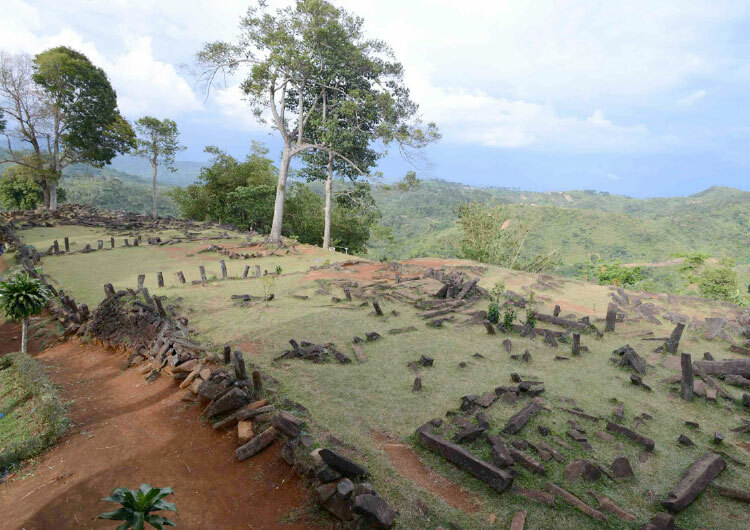 The gargantuan scale of the entire construction site of the Padang Pyramid is paralleled by the massive size of its constituent megaliths that divided each terrace into walled enclosures. 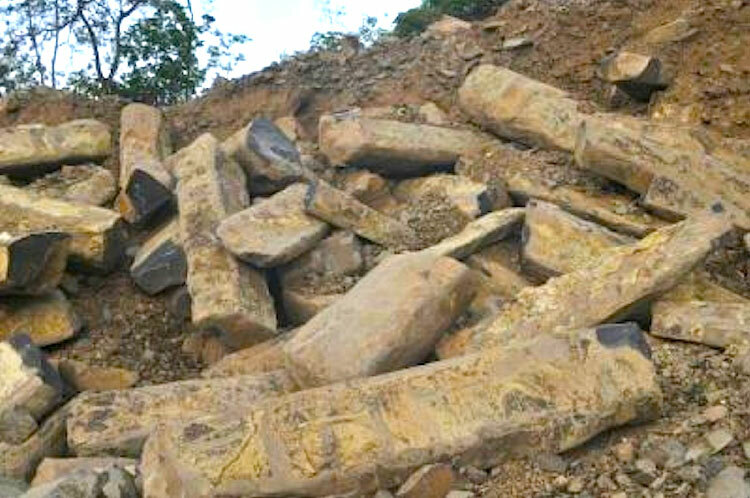 The largest andesite plinths laying on the pyramid's terraces exceed several tons (below), raising the obvious conundrum as to how these giant blocks were moved from the quarry site at the core of the mountain. The definitive answer to this enigmatic construction feat has been determined by prior archeological, geochemical and paleomagnetic investigations of stones from the pyramids of Giza, Egypt and Visoko, Bosnia. The unique chemistry of artificially manufactured geopolymer stones was first ascertained by J. Davidovits concerning the synthetic constitution of alumino-silicate limestones comprising the Great Pyramid, revealing the advanced ancient application of paramagnetic metals in casting pyramid blocks. Electromagnetic functions of the piezoelectric pyramid blocks extend beyond the chemistry expertise of Davidovits, yet a broader knowledge of wireless technologies developed by the modern inventor Nikola Tesla confirms the resonant psychoacoustic use of magnetic pyramids for bioelectrical qi healing. 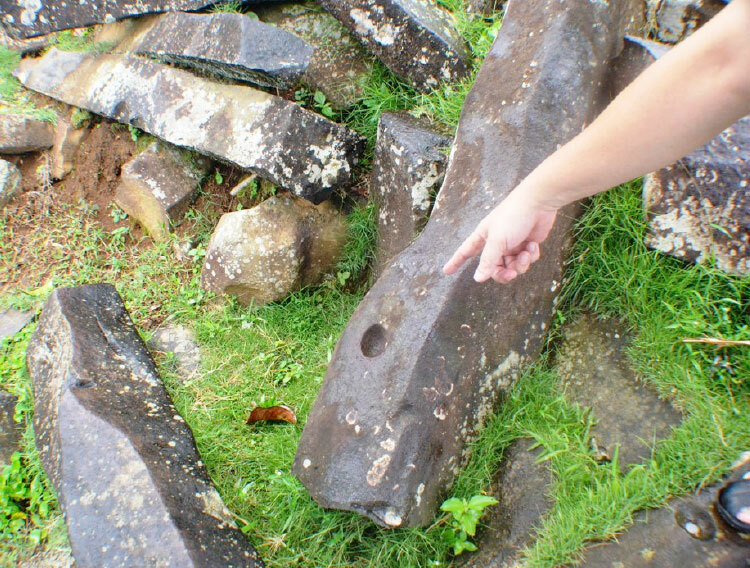 Clear evidence that the andesite plinths comprising the bulk of the Padang Pyramid construction were actually fabricated as cast geopolymer blocks has been preserved on many of their surfaces as small hemispherical concavities or 'cup-marks'. These circular depressions are seen on hundreds of stone plinths, yet have not been properly identified by on-site archaeologists despite their sheer abundance. Tourists at the Padang Pyramid pose with the giant plinths for memorable photographs, often remarking and pointing out the obvious circular concavities on the stones that archeologists never seem to notice (above). Why is it that archeologists have no explanation for the abundant artificial features exhibited on these stones, and furthermore, have all apparently been trained to pretend as if they do not exist at all? The veiled reason for this purposefully ignorant academic stance is now becoming clear to those who understand the complex function of the pyramids as accumulators of 'free energy' transduced from planetary infrasound resonance. Profit-run power corporations ensure that controlled government archeologists throughout the world reinforce mass denial of the electricity-producing and weather-regulating functions of pyramids as a globally-geopositioned infrasound network of resonant oscillators. Repeated denials by paid-off government 'officials' maintain the faltering grip of psychopathic control over the energy resources and technologies of our planet that has dominated humanity for the nearly 13 millennia that have elapsed since the destruction of the pyramid-building Atlantean civilization. 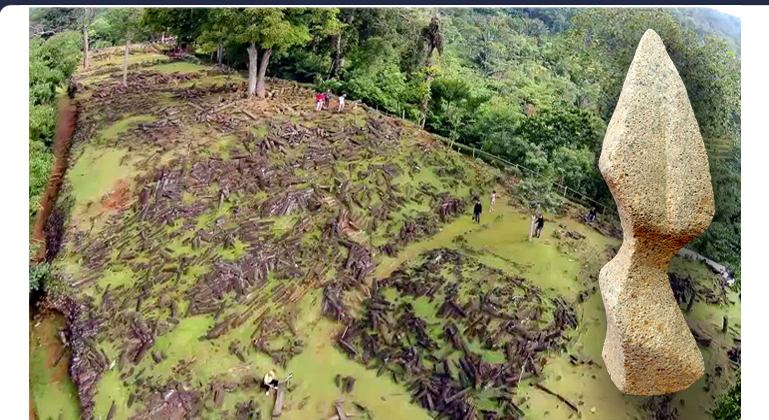 How can such an insidious longterm plan of suppression be connected with cup-marks at the Padang Pyramid? 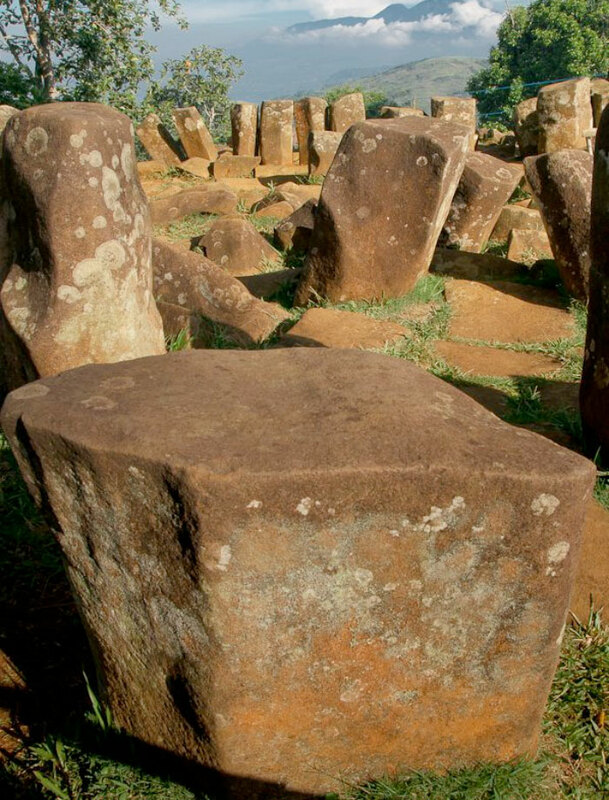 Along with studies comparing the density and elemental composition of the megalithic plinths versus natural andesites, such unmistakable details as repeating circular cup-marks prove the megaliths at the Padang Pyramid were actually cast as synthetic stones, having been reconstituted from a geopolymer slurry mixture composed of fine black andesite sand, powdered laterite, kaolinite clay, fly ash and water. The great variety of locking features visible on the surfaces of the megaliths reflect the same special seismic construction features documented at the refaçaded mountain pyramids of La Maná, Ecuador. A series of archeological trench excavations were conducted in August and September of 2014 by government-approved archeologists employing the subsidized labor of military personnel. While being limited to depths corresponding to the first and second layers of the pyramid, these sites exposed and removed a great abundance of much smaller, geometrically faceted andesites that present their original, orange mold-made surfaces without the layers of bacterial and fungal growth that occurs above ground. Video recorded by Youk Tanzil-Full on October 14, 2014 documented a magnetic anomaly ~1m above Terrace 1 that induced the perpetual spinning of his cellphone's digital compass indicator (above). Analog magnetometers also register rotating magnetic fields transduced from localized infrasound by piezoelectric crystals and magnetic particulate metals within the Padang Pyramid's synthetic andesites. 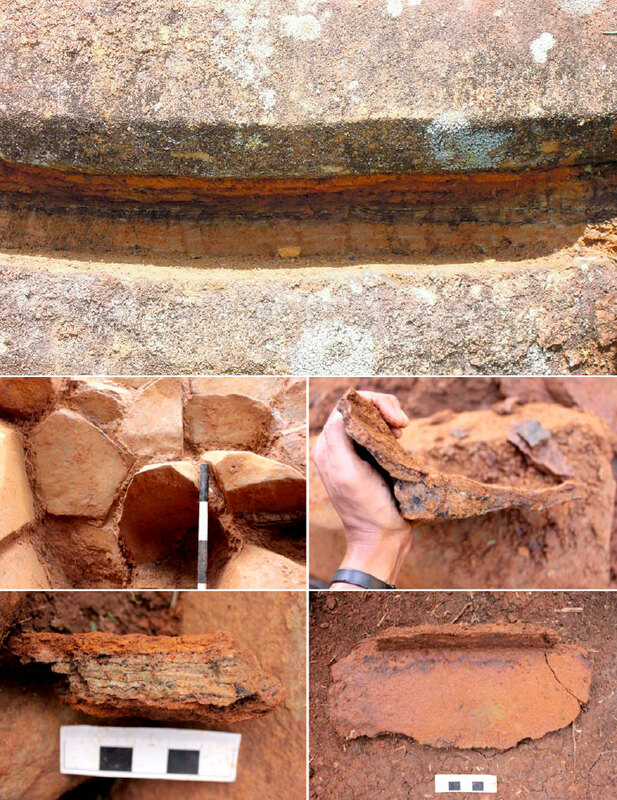 As attested by the many trench excavations photographically documented on the main terraces of the Padang Pyramid, there is a noticeable lack of cup mark features to be observed on the tightly stacked andesite plinths. What's more, none of these mold-made foundation stones present the megalithic proportions that characterize the cup-marked plinths strewn about the surface above. The consistent use of an orange cement binding material was also carefully documented, having been painted in thin layers between the interlocking plinths comprising the pyramid's multi-staged rectangular foundations (opposite). This simple geopolymer cement is composed of about 45% iron, 41% silica and 14% other clay minerals --identical to the kaolin clay-based cements of pyramids in La Maná, Ecuador. The first ancient relic to emerge from the deeper layers of excavation at the Padang Pyramid reveals the specialized biophotonic hands-on healing practices for which the megalithic mountain was designed. 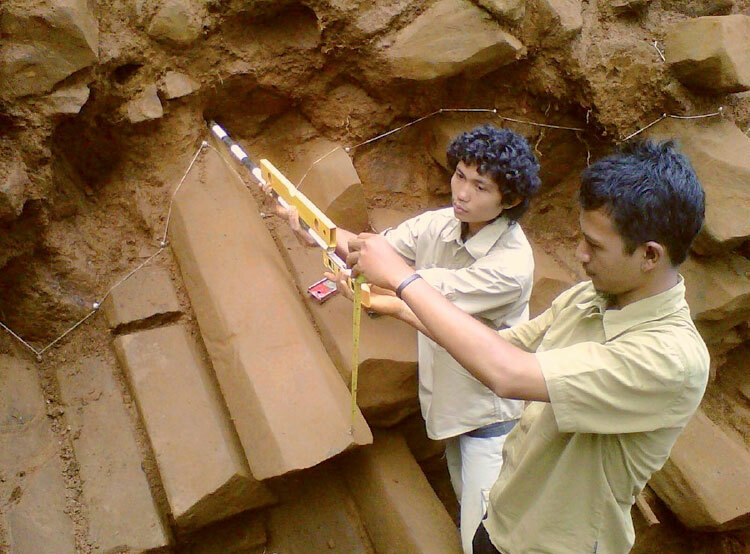 The unusual stone artifact was uncovered in a large trench being excavated on one of the terraces of the Padang Pyramid (above), having apparently been designed with an ergonomic handle that can be held most comfortably in the left hand. The notable weight of the object betrays a very high density that significantly exceeds the density ranges of all natural basalt, andesite and diorite stones. 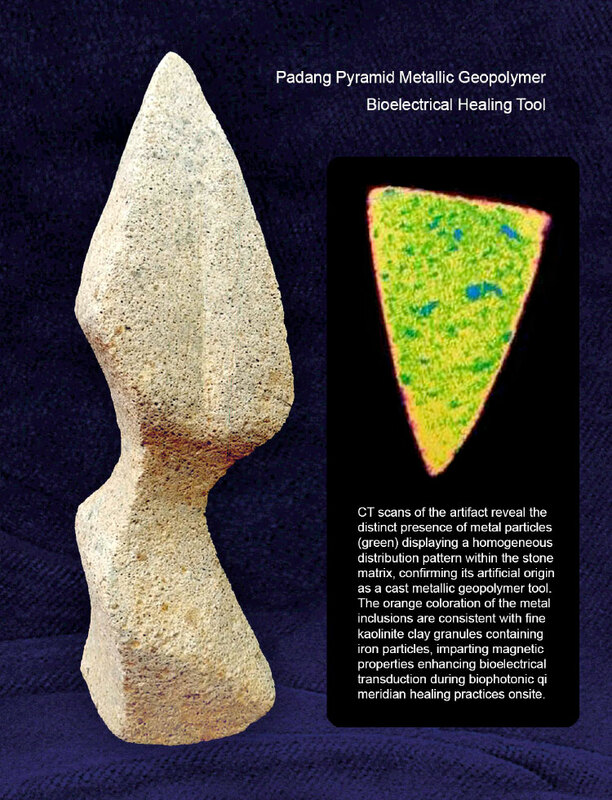 The interior composition of the hand tool artifact was investigated by CT scan, revealing fine metallic particles distributed evenly throughout the matrix of the stone (above). 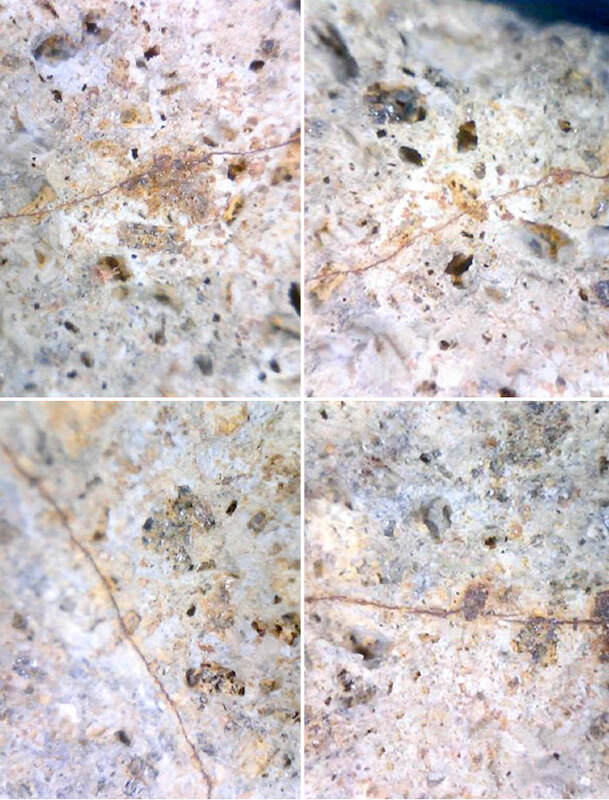 Surface micrographs of the hand tool taken at 32x magnification reveal orange colorations that suggest iron as the main constituent of the metal inclusions, while shiny grey nickel particles are also visible. Selective use of magnetic metals in the production of synthetic 'firestones' was also replicated in the pyramids of La Maná, Ecuador. These findings deny the possibility that the handheld tool was simply carved from natural stone, but confirm the object's synthetic origin as a geopolymer product cast from a liquid slurry of pulverized stone, kaolin clay, metal particles, fly ash and water. This artificial stone manufacturing technology applies the piezoelectric properties of natural andesite, while fine ferromagnetic inclusions amplify EM field strength around the tool. High metal content of the Padang Pyramid geopolymers served the same function. Blunt edges on the tool were likely used for applying acupressure along the meridians of the body during bioelectrical healing practices rooted in ancient Ayurvedic knowledge of the biophotonic 'rainbow body'. 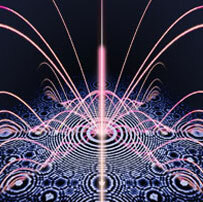 Details concerning the tool's highly specialized EM function for bioelectrical qi healing practices are now coalescing in the context provided by breakthroughs in the fields of biophotonics and psychoacoustics. The innate electrical conductivity of the human body is enhanced by drinking Ayurvedic gold and silver nanocolloids called Soma, the 'Elixir or Life', enabling prolonged exposure of the human body to the regenerative ultraviolet-A and infrared radiations of HHO plasma. Rotating EM vortices transduced from infrasound standing waves by the metallic geopolymer stones of the Padang Pyramid direct electrical currents though bare feet, magnetizing blood metals and increasing the biophotonic radiance of the body's cells. The induced red/blue electroluminescence of millions of gold and silver nanoparticles generates a rejuvenating intracellular luminosity that extends human lifespans by hundreds of years. Cayce's remarkable explanations are only now becoming recognized in the archeological record as magnetic pyramids. Cayce identified the Atlantean leader Ajax as having disseminated this knowledge to many foreign lands during expeditions in preparation for cometary swarms ~30,000 years ago. According to the timeline given by Cayce, firestone pyramid specifications were likely applied worldwide during a great constructive phase that followed the cometary catastrophes --from ~29,800bp onward. 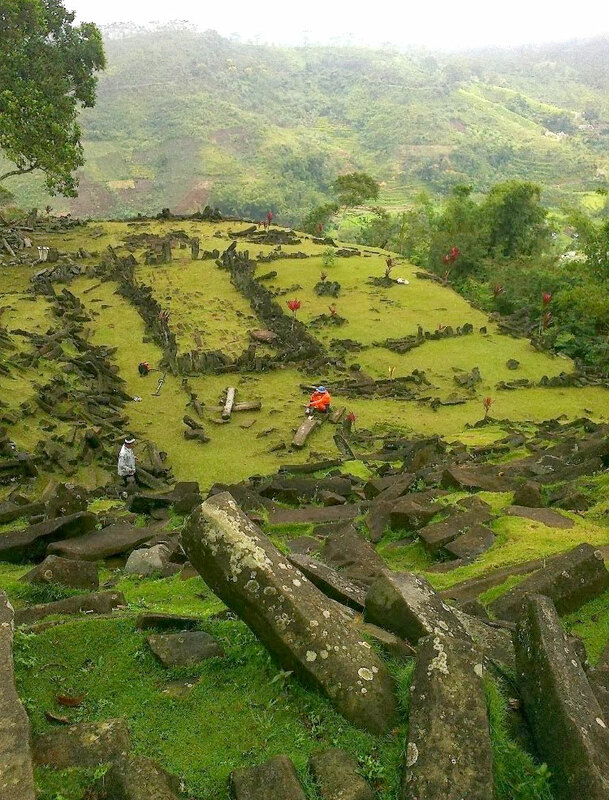 Radiocarbon dating at the Padang Pyramid has revealed the primary construction period represented by Layer 4 dates to ~29,000bp, while the secondary construction phase of Layer 3 dates to ~23,000bp. The presence of high-purity water springs flowing within the interior chambers and at the foot of the Padang Pyramid reveals another function of the pyroelectric structures: generation of HHO plasma. 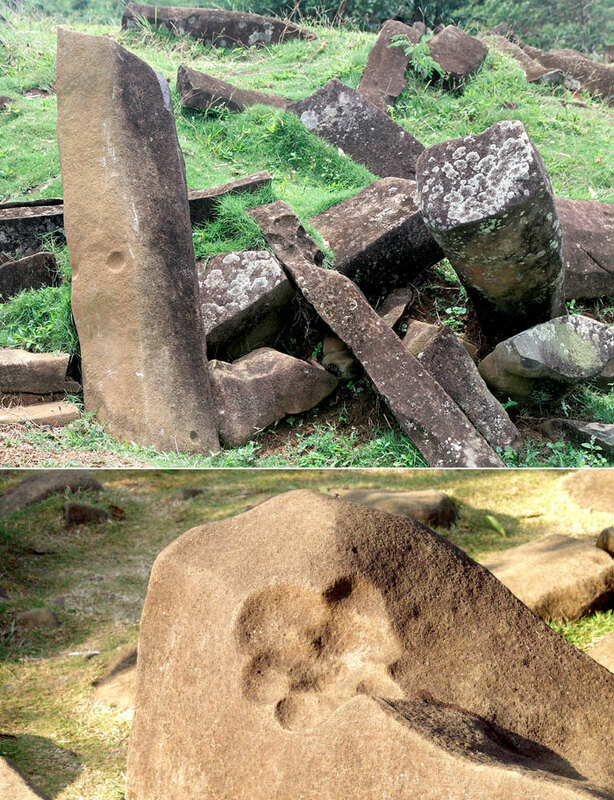 Extraordinary megalithic stonework and luminous HHO plasma phenomena experienced at the Padang Pyramid have also been identified just 59 miles away in Sumedang, West Java, where local residents now recognize Nangtung Pasanggrahan Hill as a closely related Paleolithic temple site (below). Nangtung Pasanggrahan Hill, West Java, Indonesia (6.8623°S 107.9003°E) is 5,675 miles from the Great Pyramid, comprising 22.80% of Earth's mean circumference. Distinctive man-made orange cement coatings are clearly discernable on all the original cast surfaces of these synthetic megaliths, with the stones' black andesite interior having been exposed along fractured areas where recent damage was incurred during removal by an excavator, parked in the loading area below (below). Destructive commercial removal of the giant man-made plinths for use in modern construction projects has continued for years despite strong evidence publicly presented by local residents regarding the site's great significance. 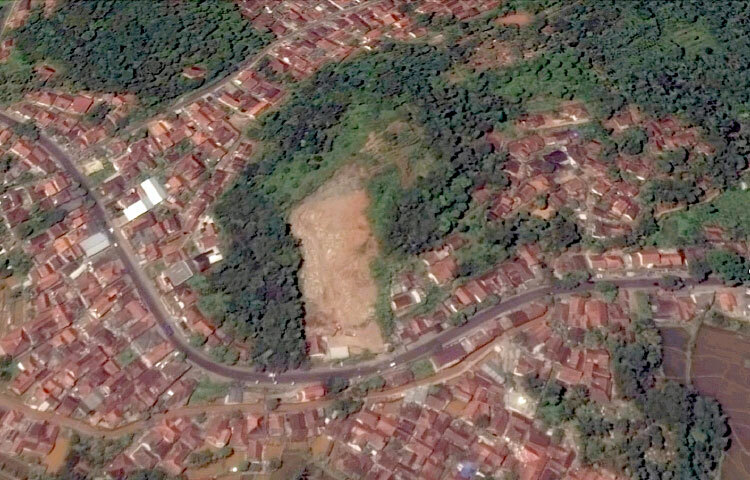 Area residents also report the presence of a man-made tunnel formed by the same typical squared andesite plinths running directly into the Nantung Temple from the north bank of the Cipeles River that flows alongside the two-lane Sumedang-Bandung Highway (satellite image, below). 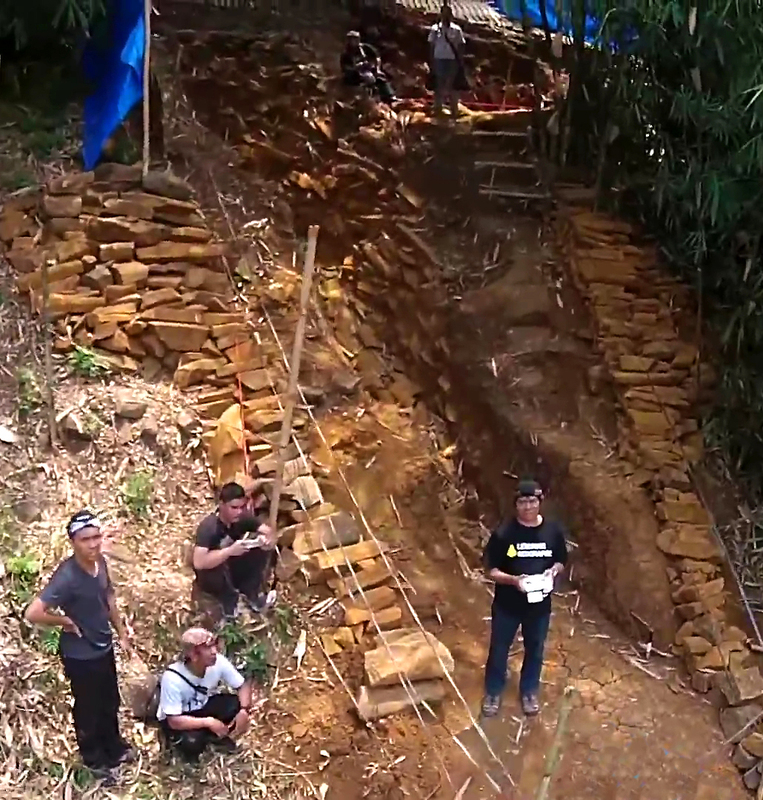 The obvious double standard being employed by the Indonesian government in allowing corporate destruction of the Nantung Paleolithic temple, while at the same time preventing excavation of the known interior chambers of the Padang Pyramid, confirms their criminal participation in the global governmental coverup of ancient 'free energy' pyramid technologies now becoming fully exposed. 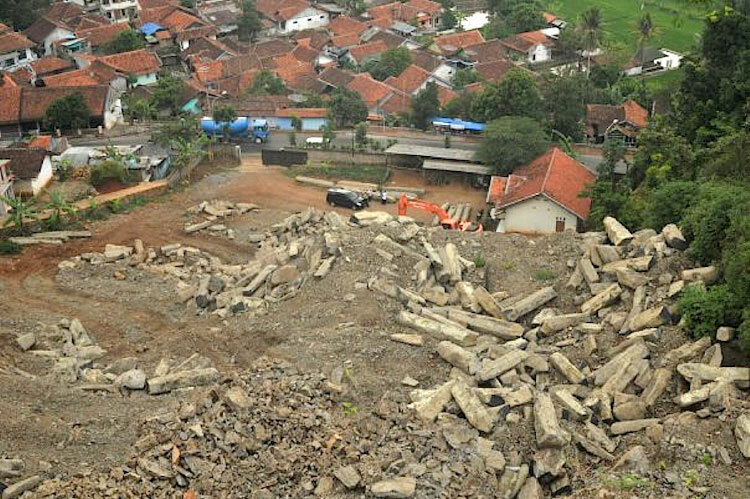 The Indonesian government has even declared layers 3 and 4 of the Padang Pyramid as National Security Secrets in a desperate attempt to conceal evidence of the pyramid's advanced technological functions, as EM vortex effects intensify with the Magnetic Reversal of our planet now underway.